I had a friend who a few years back had a Waveski and who swore to me, that if I really wanted to enjoy the UK surf, that I should get on a Waveski. 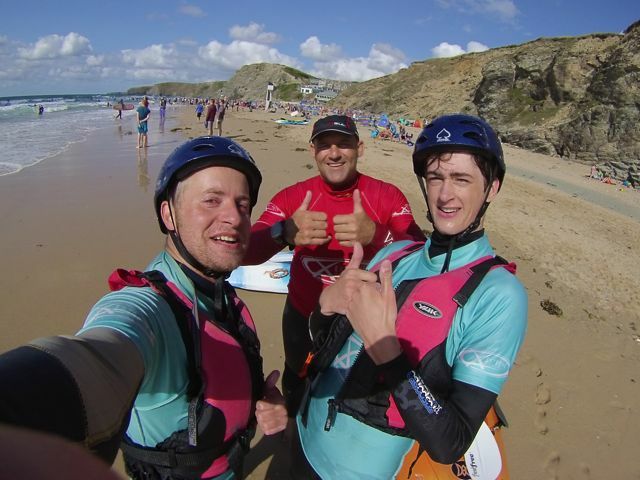 So whilst in Watergate bay in Cornwall, I signed up to a 2 hour lesson with the Extreme Academy to give it a go. Arriving at the beach on a hot summers days was a good start, but the waves looked a little messy, so with nothing to lose I headed down to the Extreme Academy. Carl my instructor introduced himself and also the other person on the lesson Toby. With a little experience in paddle sports from both of us the lesson looked like it had a lot of promise. We kitted up in safety gear, including a buoyancy aid and helmet, with an very insightful explanation for why both were essential kit. We grabbed a waveski each and headed to the waters edge and our entry point. It was a little spot at the edge of where the surfers were, to give us room for potential errors and wipeouts. As these waveskis aren’t attached to you by a leash, if you come off they could carry on with the wave and into someone else. Carl talked us though various elements of Waveskiing, from paddle stroke, using the straps correctly, how to paddle out, how to catch a wave, how to steer, the list goes on, but for once in my life everything was sticking! It all made complete sense to me, and watching Carl demonstrate made things very clear. It was now our time to get in the water and put everything into practice. I will admit I had a few butterflies paddling out, but quickly turned and caught a small wave back in. Feeling more confident having caught a wave, I worked my way out over a few waves, making sure my knees were strapped in, and making sure that I kept my feet and bum in the correct position. 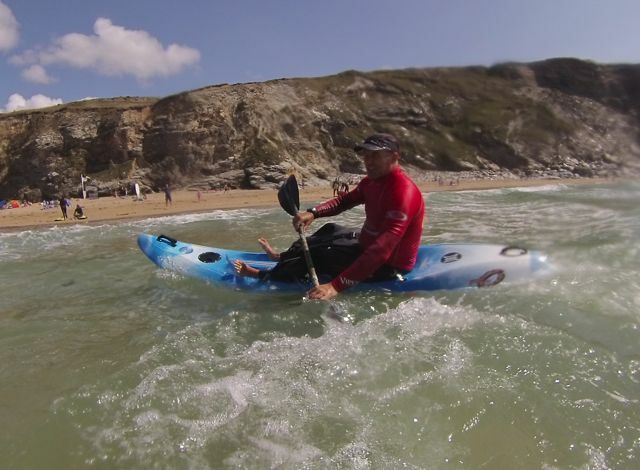 I then spotted my chance and turned into a wave a couple of feet big and paddled. Carl had told us to lean back as the wave picked us up and just to use small dabs of the paddle to help with direction, so with this in mind I went for it. I was amazed how stable the Waveski was, the huge rocker on these Waveskis does it’s job and there is no chance of nosediving. Although it felt like a steep take off, I was soon dabbing the blades in the water and shooting down the wave. I was flipping brilliant! Looking up I saw Carl putting his thumbs up, so it must have looked ok from the shore too. I looked around for Toby my Waveski buddy in the lesson, in time to see him also shooting down a wave with a smile like a cheshire cat. We were both loving it! We carried on working on our wave selection which was played huge part of getting a decent ride, with a few tips and corrections from Carl along the way. We were both riding a few nice waves by now and even correcting ourselves and saving ourselves from wipeouts. 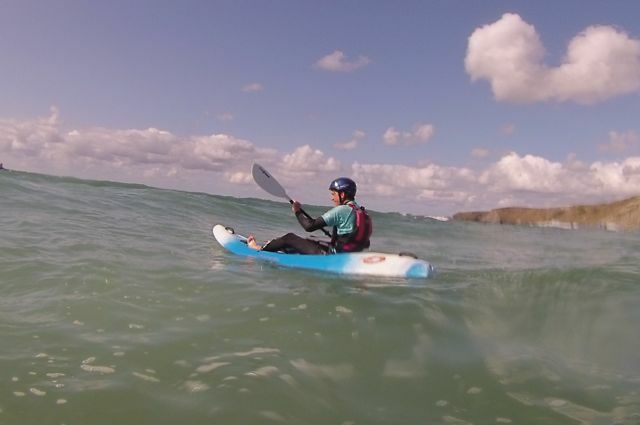 Its a really lovely feeling gliding along a nice clean shoulder on a Waveski, and the boards react fairly well when you need to turn. We seemed to be having all of the fun in the surf, even if the waves were a little messy still. Carl had given us excellent instruction, Toby was a top wing man, and the weather had been kind to us. 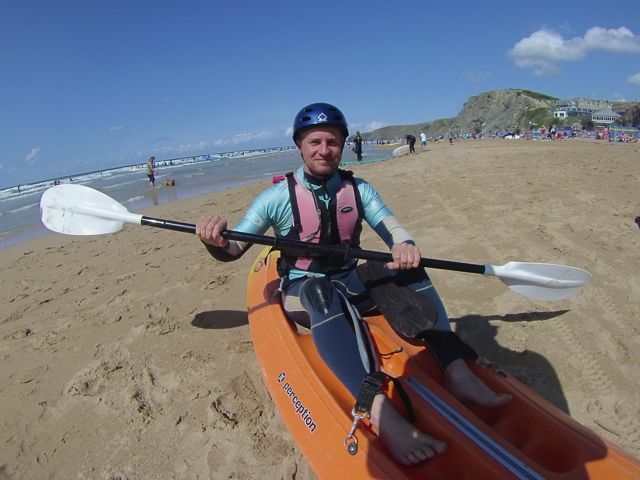 A top day at Watergate bay learning a sport I will be taking part in again very soon. 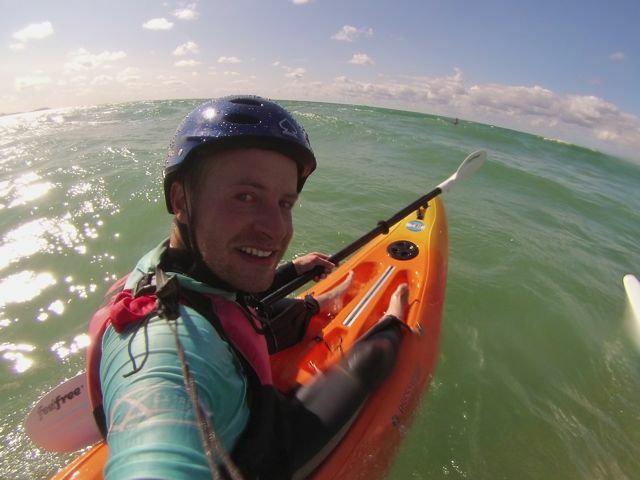 Waveski is awesome, and my mate was right to recommend it! To find our more about the Extreme Academy, click on the link.